Revyn Sadri is a Dunmer warrior living in the city of Windhelm, in the Gray Quarter. He owns and runs a small pawn shop, Sadri's Used Wares, which also serves as his home. He becomes a possible marriage partner after you complete his favor quest. He is also the brother of the Cruel-Sea clan employee, Idesa Sadri. Revyn Sadri begins his day at 8am by waking up and opening up his shop. He will tend to his store for twelve hours before closing down and having a short nap. At 8:30pm, he will leave his property to go have dinner at the New Gnisis Cornerclub. He will finally return to his home and place of business at 12:30am, so that he may sleep. He will continue sleeping until 8am, at which time he will wake up to repeat his schedule. Revyn wears a set of clothes and a pair of boots. He carries an iron dagger to defend himself. Besides that, he carries a key to his store as well as a selection of common loot and gold. Approaching Revyn will have him assure you of the good nature of his operation: "All my goods are legitimate, which is more than I can say for some." 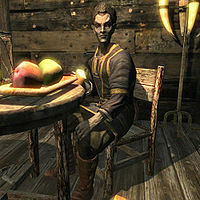 He will also make a comment on his higher than average success level for the Windhelm Dunmer, by claiming he enjoys giving back to the community: "I like to share my good fortune with those who deserve it." He may also advertise newly acquired products by saying: "Trader dropped by recently with some lovely pieces, if you'd like to have a look." Should the Imperial Legion take Windhelm and end the Civil War, he will make a comment on how he enjoys the new state of affairs: "Can't say I mind the sight of all the Imperial guards. It's a change for the better." Speaking to him while he is tending to his business and asking him about his suppliers will have him explain how he comes about his wares: "I've scraped this collection together by whatever means I could. I do some business with the trade caravans, and I've picked up a number of items from adventurers like yourself. A few intrepid souls even brought some items back from Morvunskar, the fort southwest of the city." While working, he will end conversations by saying: "Do come again!" After work hours, he will instead say: "Very well." Asking him if any of his goods are stolen will have him reveal a grave error he made: "Of course nothing in here is stolen. Only a careless, shameful, idiotic fetcher would do something as stupid as to buy pilfered goods.... Oh by Azura, I've made a terrible mistake. I bought a gold ring, and Viola Giordano has been missing a ring that looks just like it." Telling him you will do this favor for him will have him explain the extra danger of the job: "It's not that easy. She'd go to the Jarl if she knew I was even remotely involved. You have to get it to her some other way. Look, it's dangerous, but if you sneak the ring into her house. Put in [sic] a dresser or something. I will make it worth your while." If you instead just state that the situation is unfortunate, he will reply: "You're telling me." Accepting the quest will have him say, "Don't let Viola catch you in her house." as you leave. Returning to him before completing the task will have him remind you of your job: "Sneak that ring back to Viola before we both get caught." If you accept the quest, you will either have the option of doing as Revyn says and breaking into her home and returning the ring, or just returning the ring to her directly. If you reveal the truth to Viola, she will state that she intends to punish Revyn for his crime, and give you some gold as compensation as well as allow you to marry her in the future: "Oh, really? So that Dark Elf took my ring. So typical of his kind. I think the Jarl should hear about this. Maybe double his taxes. No, triple them. That should teach those people a lesson. You deserve something for sniffing out that thief. Here." Revyn's disposition towards you will drop due to this, but he will still offer his merchant services. Completing the quest by planting the ring will have him instead ask if the job is done when you next visit him: "Have you taken care of that... little problem?" Telling him it is done will have him gracefully thank you for your services with gold, the offer of speech training up until level 50, the ability to marry him, and the line: "Thank you. Thank you! Azura's Prophecy always guide you to fortune. Speaking of fortune. Here. Everything I earned from my last shipment. It's yours." The guards will direct you to visit his shop by saying: "You should unload some of that unwanted gear. Head over to Sadri's Used Wares, talk to the Elf." 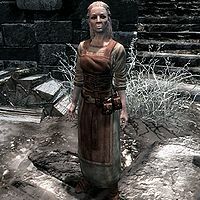 Aval Atheron will share the sentiment: "Be sure to stop by Sadri's Used Wares in the Gray Quarter." Revyn: "Niranye, I just have to know -- what is your secret?" Niranye: "My... my what, now?" Revyn: "You know. Where do you get your goods? I am always amazed at how you manage to sell things so cheaply." Niranye: "Oh, just a matter of finding the right suppliers." Revyn: "Well, I'll want to meet them next time they're around. Maybe you can give an introduction." Niranye: "I'll consider it. Many of the people I deal with are... secretive. You know how it is." Revyn: "Of course! I undersand [sic] completely. You just put us in a room, and I'll do all the talking. No worries at all." If you marry him and opt to move in with him, he may no longer offer vendor or training services, although everything in his shop will be marked as owned by you. He originally played a role in Blood on the Ice, with you being sent to him to investigate a clue. This was cut from the game, but signs of it can still be found in the Creation Kit. His shop may be locked during normal business hours, and entering will count as trespassing, although Revyn is standing at the counter. Wait for a day to get him to reopen his shop. After doing his favor, the option to marry him may not appear. The dialogue option to invest in his business will still be there after you have invested in it. This is due to a mistake in the scripting for the investor quest linking him to Whiterun instead of Windhelm. Even if you move him into your own home after marrying him, in addition to his spousal dialogue he may continue to say things such as "Have a look around, I buy and sell just about anything," as well as other lines typically said by general goods merchants. This page was last modified on 18 October 2018, at 02:09.